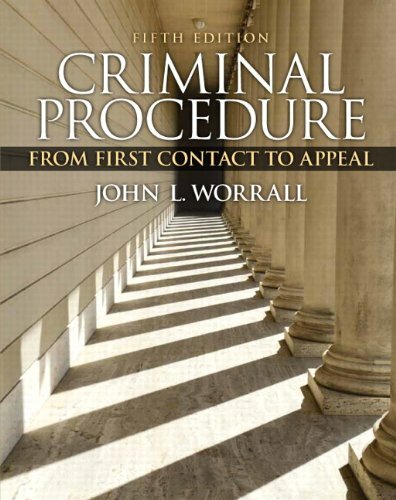 This comprehensive text uses a real world focus to cover all of criminal procedure, from first contact to appeal. Criminal Procedure: From First Contact to Appeal, 5e is a comprehensive introduction to criminal procedure, from first contact with the police, all the way through to appeal. The text is divided into five parts: (1) Introduction; (2) Search and Seizure; (3) Interrogations, Confessions, and Identification Procedures; (4) The Beginnings of Formal Proceedings; and (5) Trial, Conviction, and Beyond. The latter two topics are rarely covered in conventional criminal procedure books, particularly at the level of detail found in this text. This book presupposes no legal expertise, connects criminal procedure cases to the real world through innovative pedagogy, and encourages students through numerous decision making exercises to be critical thinkers by putting them in the position of judge.